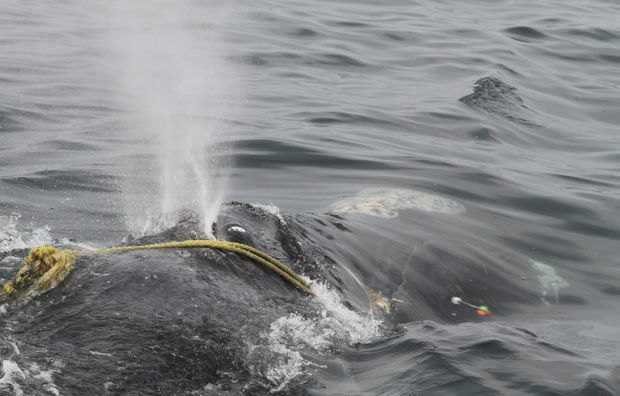 A North Atlantic right whale tangled in fishing rope is shown in a handout photo. New Brunswick Liberal MP Karen Ludwig is calling for a federal study to take a closer look at the state of Canada’s endangered whales. A New Brunswick member of Parliament is calling for a federal study to take a closer look at the state of Canada’s endangered whales. Karen Ludwig, the Liberal member for New Brunswick Southwest, has tabled a private member’s bill that is expected to be debated in the House of Commons on Monday. Ludwig said she felt compelled to do something after 18 North Atlantic right whales were killed in Canadian and U.S. waters last year. “Living on the Bay of Fundy, my interests in the protection and recovery of whales was initially based on my experience locally, and what they mean to us from an ecological, cultural and economic standpoint,” Ludwig said in an interview. As well, she said she was spurred to action after whale rescuer Joseph Howlett was killed by a right whale after he cut it free from fishing gear last July. Howlett was from her riding. She said it was a tragedy to lose someone who had dedicated his life to rescuing entangled whales. “I would like to dedicate my motion to Joseph Howlett and the work that he did through the whale rescue team,” Ludwig said. The proposed study, which would also look at beluga and killer whales, has the support of Fisheries Minister Dominic LeBlanc and Transport Minister Marc Garneau, Ludwig said. Whale populations are on the decline. There’s just 450 North Atlantic right whales, 900 belugas and 76 southern resident killer whales in the wild. Ludwig said she originally suggested a study by the Standing Committee on Fisheries and Oceans last fall, but that was before the federal government enacted several measures aimed at protecting right whales. That work has included reducing speed limits in the Gulf of St. Lawerence, starting the crab season earlier and limiting the amount of fishing gear on the water. Garneau said the speed limit of 10 knots, imposed on large ships in the Gulf last year, will be reinstated in the western part of the Gulf between April 28 and Nov. 15. Two shipping lanes with normal speed limits will be kept open north and south of Anticosti Island as long as there are no whales in the area. Fines for violating the speed limits range from $6,000 to $25,000. Tonya Wimmer of the Marine Animal Response Society said it’s important to determine if the federal measures are working, and she would like to see other species of whales included in the proposed study. Researchers have not spotted any right whale calves this spring, raising further concerns about the declining population. Moira Brown, senior research scientist with the Canadian Whale Institute, said unless the numbers change, the North Atlantic right whale could become functionally extinct in less than 25 years. She is throwing her support behind Ludwig’s call for a study. Ludwig said her original suggestion was for a study on right whales, but the Fisheries Department suggested it should also look at the other two species. Wimmer said the study should go even further than that. “It cannot be for just the three that have been highlighted. They are obviously in a critical state, but we have others that are also being impacted by the same activity,” she said.